World Series of Fighting goes head to head with UFC 180 and Bellator 131 this Saturday night and will feature three title fights. The event is set to take place at the USF Sundome in Tampa, FL and will play host to the middleweight, lightweight and female strawweight championship bouts. The four fight main card will air live on NBC Sports Network. David Branch will defend his middleweight title against top 10 185 pound Yushin Okami. 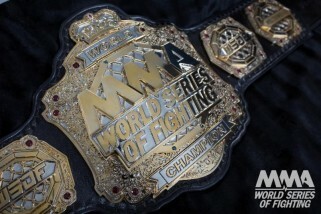 Branch is 4-0 under the WSOF banner and defeated Jesse Taylor back in June to capture the belt. Okami won his promotional debut back in March by submitting Svetlozar Savov. Lightweight champ Justin Gaethje puts his title up for grabs against Melvin Guillard. Gaethje has an impressive 10 knockouts on his resume and will look to keep his 12 fight undefeated streak alive. Jessica Aguilar makes her first title defense against challenger Kalindra Faria. A lightweight scrap between Eric Reynolds and Jorge Patino kicks off the main card.